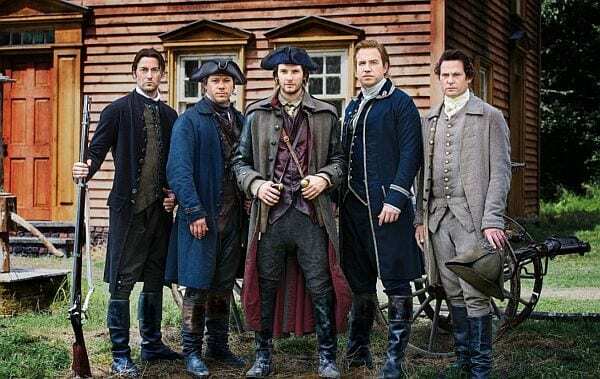 History, the network for male entertainment formerly called the History Channel, is taking steps not be chastised again for producing bogus historical accounts. The effort appears as honest as a baby step. 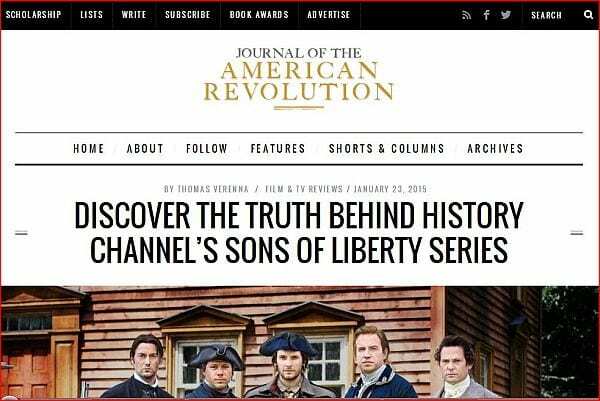 The website for its upcoming mini-series Sons of Liberty sports a link called the “Historian’s View.” Therein lays History Channel’s disclaimer. 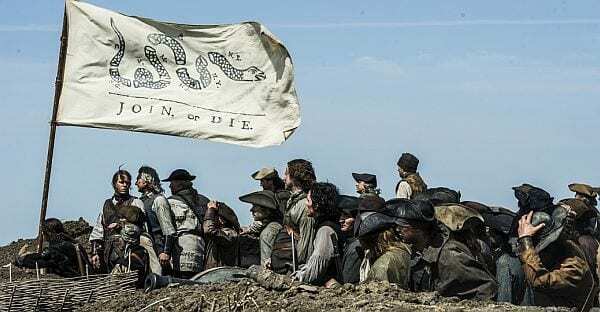 “SONS OF LIBERTY is a dramatic interpretation of events that sparked a revolution. It is historical fiction, not a documentary.” So much said for History to set the record straight, but is it? Over the years, we’ve taken History to the woodshed a number of times, recently in 2013 for “making [up] history every day” regarding productions relating to Jesse James. Challenging History has stopped it from producing more Jesse James fictional invention. Realistically, though, we expect the network will continue to develop more fictional entertainment around Jesse in the future. Jesse James is too appealing just to give up. Unfortunately, neither historians of Jesse James, nor historians. in general, carry the political clout of the family of John F. Kennedy, as we reported. The Kennedy clan effectively put a cease and desist order on the network with only the threat of going to court. History has since dropped any proposals altogether of producing fictional history around the personage of President John F. Kennedy. The Journal admits that the production values of the mini-series are pretty good. The show is entertaining. But the show also is flawed, sufficiently enough to warrant a lengthy list of fact checking on its historical facts. The Journal breaks down each episode here, as we’ve done here in the past. Nothing would please us better than, not to be the guardian of the History Channel’s truancy. If only the network had changed its name from the History Channel to Wishful History. Then there would be no need to disclaim its productions. As it persists in its brand of flawed, interpretative, alternate, or downright bogus history, the network and its productions must continue to be monitored for a chronic lack of integrity masquerading as an authority. 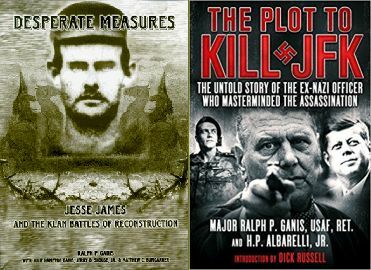 In his book, Desperate Measures, Ralph P. Ganis falsely claims a relationship between Frank & Jesse James and the Ku Klux Klan. The book was debunked by reputable historians as well as by the James Preservation Trust representing the James family. His publisher, Tarheel Press, formerly fell silent and stopped fulfilling orders for the book. Now Mr. Ganis has resurfaced to sell his book again. This time in Stanly County, North Carolina. To refresh interest in his book, Ganis promotes a new falsehood. Ganis now claims he himself is related to Frank & Jesse James. For the record, Ralph P. Ganis never has produced any documentary evidence to the James family, or to the James Preservation Trust, verifying his claim of family relationship. In his assertion, Mr. Ganis joins a long list of James family claimants, all of whom ultimately share a common destiny as shameless self-promoters and charlatans. The following book review for Mr. Ganis’ book appeared in the James-Younger Gang Journal, Fall 2007, pp. 4-5. In spite of the title, this book as a very small amount of information about Jesse James. The book’s real focus is on the Kirk-Holden War in North Carolina during Reconstruction. Before the Civil War, W.W. Holden had been a strong advocate for secession. After the War, Holden became a Radical Republican and was appointed Governor of North Carolina. Holden ran again during the first post-war election but was not elected. A term later he was elected governor of the state. Holden’s administration was very corrupt; he was eventually impeached and removed from office. The Union and Loyal Leagues became very strong in part of North Carolina and the local population fought back in a number of ways, through the Klan, and other like organizations. The Union/Loyal Leagues were lead by Whites from the North and they organized local Blacks and made sure they voted for Radical Republicans. Some of these Union/Loyal Leagues also encouraged barn-burning and other illegal activities by Blacks. When the white population organized activities to stop these illegal actions by Blacks, Gov. Holden declared a state of insurrection in two counties. Holden then hired one ex-Union officer named George Kirk (a thoroughly unsavoury and brutal character) to form a private army (about 1,000 strong) to retaliate against the local White population. The authors of this book jump to conclusions that because several families from this section of North Carolina settled in or near Clay County, Missouri, the home of the James boys, that the James boys had some active role in Klan activities in North Carolina and elsewhere. This would be exciting stuff if the authors had any real evidence to back up their suppositions. Instead, the book uses a lot of oral history and traditional tales that have been handed down through the generations instead of hard evidence. There are many statements that say things like, “It is believed,” “It is documented that,” “It is logical to assume,” “It is possible,” etc., etc. Then there is little or no documentation to back up these statements. 1. Jim Cummins (a sometime James Gang member) had a brother-in-law that rode with Gen. Nathan Bedford Forrest. (Forrest was widely believed to be the commander of the Klan throughout the entire South.) “This may have relevance of James connection to the Klan.” No supporting documentation is offered to show any connection with the Cummins’ brother-in-law, Gen. Forrest, of the Klan. This quote is taken from a summary of Frank’s trial in George Miller, Jr.’s book, “The Trial of Frank James.” The newspapers that reported Frank’s trial do not use this quote. Frank went to North Carolina looking for work. He did not find a job and quickly moved on. Readers are advised to remember also that Frank went to North Carolina after Jesse was killed in 1882. The authors offer no documented evidence that Frank James was anywhere in North Carolina during the Kirk-Holden War or at any other time during the Reconstruction troubles. 3. “North Carolina provided the James boys safe harbor as illustrated by the number of North Carolina families in Clay County, Missouri.” On page 15 the authors provide a list of more than 25 family names in Clay County, Missouri, that supposedly account for significant Klan connections to the James Gang during Reconstruction. I checked these family names against the 1860 census for Clay County. Several of these names do not appear on the 1860 census for Clay County. Several others of these family names have multiple listings that give the birthplaces of the parents in the family in Kentucky, Virginia, Tennessee, Maryland, etc. as well as some in North Carolina. Some of these family names even list the birthplace as another country. 4. The authors also list several names of the supposed Klansmen who fled North Carolina and went to Clay County, Missouri, during the Kirk-Holden War. I have checked these names against the genealogical extracts from the Liberty Tribune from 1868 through 1874. I found no evidence of numerous visits to Clay County by people from North Carolina during this period. In fact, several of these family names were not even listed in the index to these records. Furthermore, thousands of people left North Carolina during Reconstruction. It would not be surprising to find that some of them joined relatives in Missouri. Moving to Missouri, however, is not proof of Klan activities by those who made the move or by the James Gang. In summary, this book makes a lot of unsupported claims and contains no new material that expands our knowledge of the James Gang. This book does not present any data that supports or proves any Klan activity by any of the James Gang in North Carolina or elsewhere. FRAUDSTERS GO DEEP… After 21 years of monitoring Jesse James fraudsters, con artists, conspiracy fanatics, & alt-historians, one thing has been very clear. They never stop digging the holes they are in. Now, Ralph P. Ganis has resurfaced again, this time with a new conspiracy theory about JFK. No need to buy or read this book. Citing the author’s record of producing alt-history that has no basis in fact, our book reviewer for Stray Leaves won’t even review it. We’re still waiting for an autobiography by Mr. Ganis. We look forward to his explanation of how he paid off the million dollar judgement against him that resulted from his shadow Blackwater-related activities. With its developing record of concocting bogus Jesse James history for the sake of TV ratings, the television distributor formerly known as The History Channel now attacks the history of the President John F. Kennedy and the Kennedy family. TV’s History program formerly fabricated fake Jesse James history in an effort to improve ratings and to attract the young male demographic, at the expense of losing the middle age and senior demographic the channel was founded upon. The program also changed its strongly identified name of The History Channel to History.com, or simply History to distance itself from any implied requirement to deliver factual or bone fide history. Now the History program has turned to fabricating bogus political history. Blatantly written by a right wing operative, the program goes so far as to present events that never happened as occurrences of legitimate history. The program clearly has its sights set on including among its audience those political, and perhaps religious, interests chronically bent on disseminating misinformation. The relentless assault upon factual and true history by the History program ranks no less as an assault upon the nation itself. Everyone knows the mistakes of the past are bound to be repeated by those who ignore history and its lessons. Our nation’s history provides ample evidence of politicians who ignored the lessons of history to the nation’s detriment. In order to sustain itself as a nation, America requires of itself a knowledge that is truthful and factual. Manufacturing ignorance, as the History program does repeatedly, is an act far more egregious, that only can amount to being outright criminality. Every human being or nation relies upon a knowledge of the past that is factual and not bogus. An absence or distortion of such knowledge impedes the ability or a person or nation to develop and grow, and thrive on a sound footing. Providers of inaccurate or false history deprive an individual or nation of the sustenance they are entitled to. If either should fail, let history itself note the role TV’s History program contributed to their downfall.